Cells are permanently threatened by hypoxia, meaning the O2 supply limits the rate of O2 consumption. Hypoxia causes cellular dysfunction and, eventually, cell death. The activation of genes encoding adaptive proteins is of crucial importance. Some of these proteins act systemically, such as erythropoietin (EPO), which increases the O2 capacity of the blood, and others locally, such as vascular endothelial growth factor (VEGF), which stimulates angiogenesis. At the single cell level, the expression of glucose transporters and of glycolytic enzymes is enhanced on hypoxic stress. The genes for all of these proteins are under the control of the so-called hypoxia-inducible transcription factors (HIF). ability to bind the transcriptional coactivator CBP/p300. 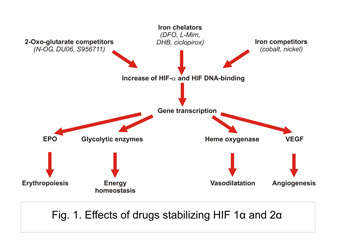 2-Oxoglutarate competitors and iron chelators inhibit the degradation of HIF-α (Fig. 1). through binding to the dimeric EPO-receptor (EPO-R). 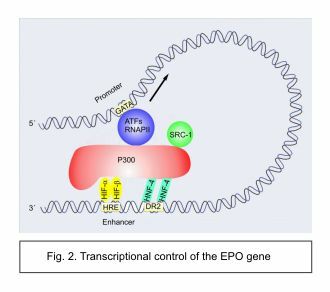 EPO signalling involves tyrosine phosphorylation of EPO-R and JAK-2, and the activation of anti-apoptotic proteins and of STAT factors. Lack of EPO results in normochromic normocytic anemia, as seen in patients with end-stage renal failure. Our studies have revealed that endogenous EPO levels are also low in patients with chronic inflammatory and malignant diseases, because inflammatory cytokines (IL-1, TNF-α) suppress EPO expression (2, 3). Recombinant human EPO is routinely used for treatment of renal anemia and chemotherapy-associated anemia. The development of second-generation erythropoietic proteins is a fascinating area in biotechnology (4). The applicability of EPO as a myocardial and neuronal protectant and its use for wound healing are under investigation. Whether tumor cells express functional EPO-R is a matter of controversial debate (5). Regrettably, EPO is misused in sports as a means of blood doping (6). We have identified peptidic mediators that can induce HIF-1α accumulation and HIF-1 DNA-binding in normoxic cells, including cytokines like interleukin 1 (IL-1) or tumor necrosis factor-α (TNF-α), and hormones like insulin. Our seminal finding that IL-1 and TNF-α stimulate HIF-1 dependent gene expression in normoxia and hypoxia has opened a new field in immunological research, with HIF-1 acting as a central player in inflammatory processes (7). Many HIF-dependent genes encode proteins that promote inflammation (e.g. VEGF, HOX-1, eNOS, iNOS, COX-2). 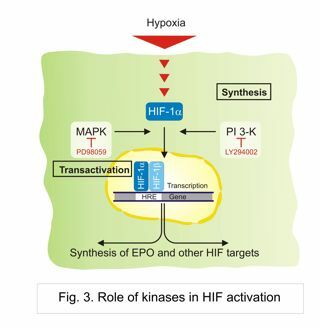 Both the hypoxic and the ligand-induced activation of HIF-1 involve the phosphatidylinositol-3-kinase (PI-3-K) and the mitogen activated protein kinase(MAPK) pathways (Fig. 3). Activation of PI-3-K/Akt results in increased HIF-1α protein levels. The MAPK pathway increases the trans-activation ability of HIF-1 (8). Taken together, there is a fine control of HIF activity, involving (i)feedback-control of HIF-α PHD-2 and -3, (ii) ligand-induced HIF-1 activation and (iii) modulation by kinases and transcriptional co-factors. Presently, the role of HIF-2α in inflammatory reactions is elucidated. Both pharmacological and genetic interventions that increase HIF activity and such lowering it are of therapeutic interest (9). On stabilization of HIF, the production of EPO increases which is of benefit in anemia. Stimulation of HIF-dependent gene expression accelerates angiogenesis for application in ischemic diseases. Furthermore, HIF activation augments cell proliferation, wound healing, and distinct inflammatory reactions. 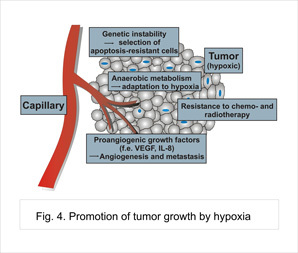 HIF suppression, on the other hand, is potentially beneficial to prevent tumor angiogenesis and tumor cell adaptation to hypoxia (Fig. 4). Erythropoietin production: Molecular mechanisms of the antagonistic actions of cyclic adenosine monophosphate and interleukin-1. Interleukin-1b inhibits the hypoxic inducibility of the erythropoietin enhancer by suppressing hepatocyte nuclear factor-4a. Biosimilar recombinant human erythropoietins ("epoetins") and future erythropoiesis stimulating treatments. Hypoxia-inducible factor-1 (HIF-1): a novel transcription factor in immune reactions. VEGF production by primary human renal proximal tubular cells: requirement of HIF-1, PI3-kinase and MAPKK-1 signaling. Hydroxylation of hypoxia-inducible transcription factors and chemical compounds targeting the HIF-α hydroxylases.